Chardonnay and macaroni cheese, anyone? Whether it’s a plate of sage butter-soaked ravioli, a prawn linguine, basil-laced spaghetti and meatballs or a good old-fashioned macaroni cheese, pasta is undoubtedly one of the world’s most widely adored comfort foods. As mentioned in our Toast BYO basics – Italian, red such as Rabbit Ranch Pinot Noir is good for tomato-based dishes. A dry white, such as Invivo Sauvignon Blanc, is a beautiful partner to buttery, garlicky dishes and a chardonnay, such as Gunn Estate Reserve Chardonnay, works beautifully with cheesy richness. Pizza doesn’t need much justification really. You love it, we love it, everyone loves it. Try out a tasty IPA like the Epic Armageddon IPA or a fruity red such as Church Road Syrah with your slice. Warming, spicy ramen is an absolute soul-soother. If you’re slurping on a salty, miso-based ramen, be bold and try out a sour beer such as Tuatara Ardennes Belgian Blonde Ale or a dry cider like Old Mout Hard Cider. If you’re chowing into something with a lot of spice, try a riesling such as Mt Difficulty Roaring Meg Riesling. Drinking sweeter wines with spicy food allows the fruitiness of the wine to really be shown off, as the residual sugars tend to take a step back when heat is involved. Whether you’re opting for a homemade Pad Thai dotted with juicy prawns or a something a little more greasy from your local takeaway, there’s a drink to enhance that magical comfort dish. Try a dry white wine such as the Invivo Sauvignon Blanc. This will cut through grease and spice without disrupting flavours. Or if you’re in the mood for a brew, try a Tiger lager. There's no two ways about it – ice cream and liqueur is a dreamy mix when looking to put a kick in your comfort food. 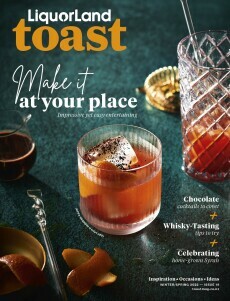 Try our Kahlua Affogato, Pink Flamingo or check out our guide to poaching fruit in liqueurs for a bit of topping inspiration.